The Handshake over the Elbe. 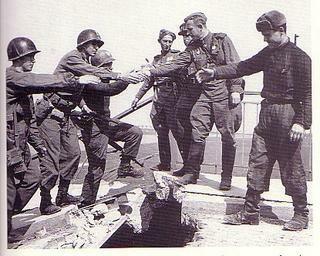 American and Soviet soldiers greet each other as allies. Torgau, Germany, April 25, 1945. Back in 1989, walking down to the docks in Sevastapol, a friend and I were stopped by an older gentleman - weatherbeaten, with a gold tooth up front (Russians have been doing "bling dentistry" for a loooong time) and a handful of medals pinned to his polyester jacket. He asked us if we were Americans, and when we said yes, he started to cry and pulled a copy of the "handshake" photo out of his pocket. He pointed to a young Soviet man in the image and said, "This is me! I was there!" I was blown away. It was like touching history. He gave us both huge hugs and kissed our cheeks. He had been waiting eagerly for the Americans to arrive after the announcement was made about the ships coming in to dock. He told us he had not seen Americans since 1945, when he returned to Sevastapol after the war. The Soviets closed the port city, and foreigners were forbidden to enter the region. He was so excited to meet us, and while it was incredibly cool, I felt bad as my friend and I were basically schlubs - two twenty-something contract-worker American kids - and I thought he deserved to tell his story to someone with a little more authority. One of the embassy's defense attaches passed by en route to the ships and we grabbed him and told him who this man was. There was a lot of saluting and more hugging and tears, and our attache took the old Ukrainian gentleman by the arm and escorted him to one of our ships. I don't know how that story ended. I was stupid and young, and I didn't have the smarts to realize that this was a story I should have followed to completion. Ignorance of youth. Regret of middle age. I'm just glad he got to spend some time with his allies again. Life is made better by little events like this. This really choked me up. It is quite likely that this old soldier is gone now. I do hope that the events of that day brought him a bit of joy and also some closer. I wish I had heard his story.